JAMESTOWN – The James Prendergast Library will hold off on auctioning any of its artwork until after a public input session is held to identify other possible alternatives. 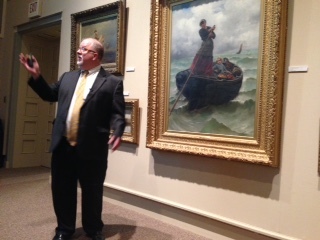 Prendergast board president Tom Rankin walks the audience through a presentation focusing on the library’s budget deficit and selling the artwork. That was the decision made Thursday afternoon by the board of trustees during its regular board meeting and after a number of residents attended the meeting to speak out against selling the art collection. According to Prendergast Board President Tom Rankin, the latest numbers show the library is facing $65,000 operating deficit for this year and a $180,000 deficit for next year. Library officials believe that by selling some of the art collection – which has a total value of approximately $3.17 million – they can add more money to the library endowment, which would then help to provide additional revenue on an annual basis. 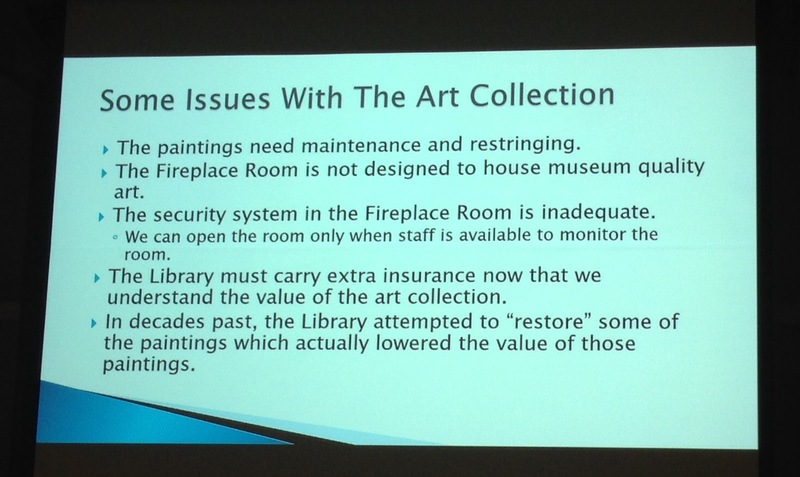 The library also believes that if they were to stay committed to keeping all the artwork, they would see an addition cost for both restoration and security. Rankin also said there would be separate restoration fees to consider, which would involve restringing and reframing several of the pieces. Ten different people addressed the board during the meeting, with about half against selling the artwork, while the other half supported the board’s initial decision. Area residents (from top to bottom): Dianne Soule, Hillary Hornyak, and Doug Champ were three of the 10 individuals who addressed the library board. Those who spoke were split between selling or keeping the art collection. “The artwork has served a purpose and now its time to move on. The artwork can not be maintained in this environment. Do you want to spend additional money and keep these on the wall or do you want to channel these to other more important assets?” Champ asked. Later in the meeting, the board entered executive session to address personnel and contract matters and following the closed-door session, it returned to open session to announce it will not deaccession any artwork until after a public input session is held. 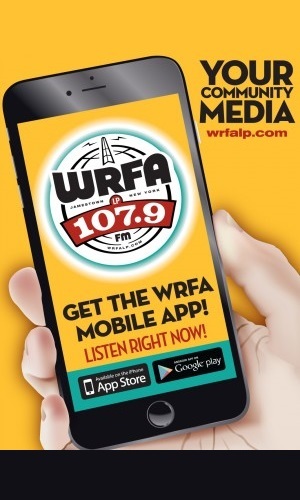 Rankin said the purpose of the input session is to identify fundraising options and other solutions to help close the budget deficit without having to sell the art collection. The input meeting will be held at 6 p.m. on Thursday, Oct. 8 and will be facilitated by Prendergast board members Bruce Gleason and Joni Blackman. It will be open to the public. 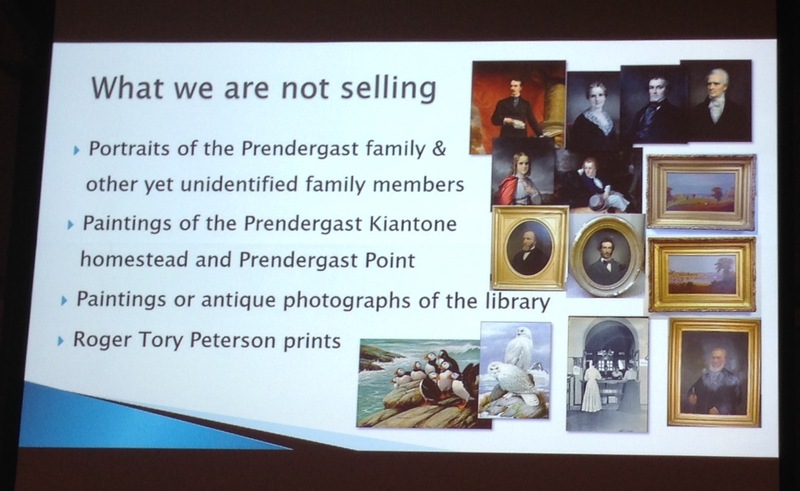 One of the slides that was part of a powerpoint presentation by the Prendergast Library during its Sept. 17 meeting. Rankin said the board’s finance committee will be meeting at the end of this month to continue to review the financial challenges facing the library and what can be done to address them. The board has already signed into a contract with Sotheby’s to auction the artwork, should they decide to deaccession any of the pieces. Rankin said Sotheby’s would only be used to auction the oil paintings in the collection, much of which were willed to the library from the Prendergast and Packard families during the early 20th century. The library has also requested that County Surrogate Court Judge Stephen Cass grant the library permission to sell the artwork if it chooses. That is required because the artwork was given to the library and intended to be a permanent asset. The next meeting for the board of trustees is Thursday, Oct. 15, which would be the earliest that the board could met to again discuss and possible deaccession pieces of its art collection. Another slide used during the Prendergast Library’s Sept. 17 powerpoint presentation.